Leaving Inbound 2014, one thing was clear - inbound marketing is no longer a competitive advantage. Sitting in a convention center with literally tens of thousands of inbound advocates clearly indicated that we’re out of the early adopter phase of adoption. This was echoed as I reviewed the recent research report from Content Marketing Institute and MarketingProfs, 2015 Benchmarks, Budgets and Trends – North America. 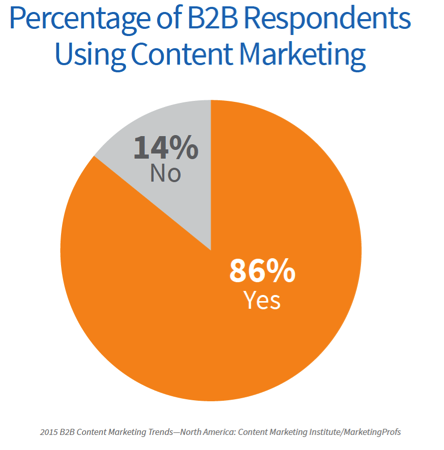 According to the report, 86% of B2B companies are using content marketing, defined as “a strategic approach focused on creating and distributing valuable, relevant and consistent content to attract and retain a clearly defined audience – and, ultimately, to drive profitable customer action.” While content marketing is not the same as inbound marketing, it is a critical portion and precursor to it. 1. 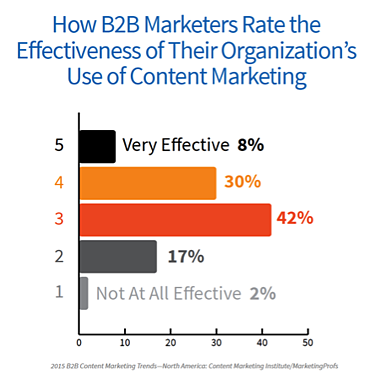 Less than 40% of companies say their content marketing is effective, and only 8% think it’s very effective. This is not a surprising statistic to me. Five years ago when I met with CEOs and executives, the debate was about whether or not content was worth the effort. Today I hear very little resistance to the “idea” of content. However, I still hear very few sustained success stories. I spend most of my time with the small and mid-market (SME) world, where they don’t have the same marketing resources as their larger competitors. There is still a big struggle to align and integrate their content with their sales process. 2. 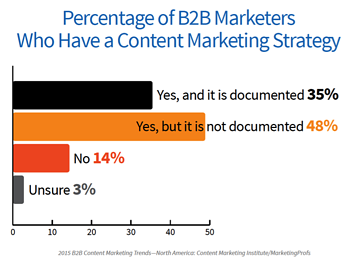 Not surprisingly, only 35% have a written, documented strategy for their content marketing approach. It amazes me everyday when I see companies of virtually all sizes, with aggressive growth plans who have failed to clearly define their buyer personas, develop messaging that stands out and sticks and have little methodology to the emails and marketing messages they send out. They’ll spend, literally, millions on sales compensation and then get frustrated that it’s not bringing the results they desire. As the saying goes, if you fail to plan, you plan to fail. And if the plan isn’t in writing, it isn’t a plan. 3. Brand awareness and lead generation are the primary objectives of the initiative. 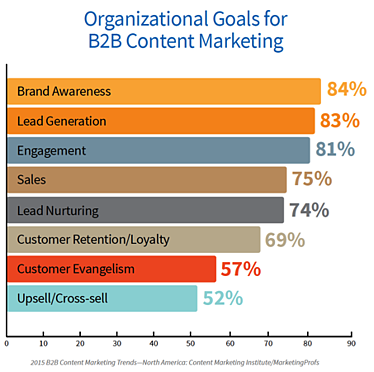 What’s nice to see is that lead generation and lead nurturing are quickly moving up the prioritization list. Although, as I’ve shared before, companies are still struggling with how to do this effectively. I’m not surprised that “awareness” is still on the top of the list. It will be interesting to see if that diminishes as companies adopt more effective measurements and are able to quantify which actions actually drive ROI. Though as I share later, I might be being a bit optimistic. 4. Website traffic is the primary metric used to measure success, and only 21% of practitioners say they are successful at tracking ROI from their efforts. This was probably the most depressing chart of the entire report. While website traffic is certainly a meaningful KPI, it’s not an effective measurement of success. At best, it’s a very early indicator to progress. It’s nice to see lead quality and conversion rates near the top, but they are both under 50%. 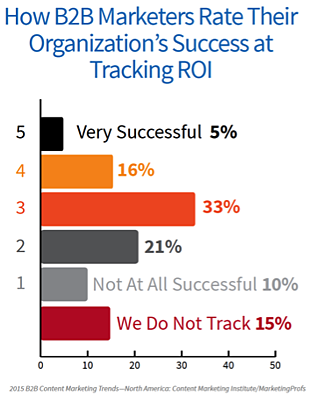 I knew companies were struggling with ROI, but only 5% consider themselves very successful at tracking ROI? Holy cow!! 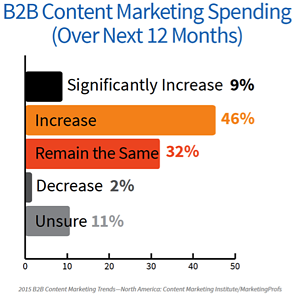 With this number, it is somewhat surprising that content marketing is growing at the rate it is. It's worth noting that those who have a written plan and approach are far more effective at assessing ROI. The key to effectively tracking ROI is to begin by tracking the right metrics and connecting those measurements to your sales process. It requires that you close the loop on your marketing and sales process. 5. 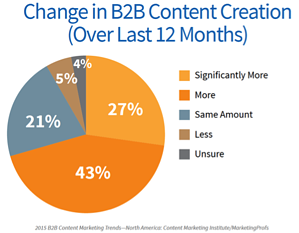 70% of practitioners are creating more content than a year ago, with 27% creating significantly more. 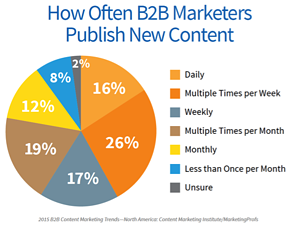 Additionally 42% say they produce new content on a daily or multiple times per week basis. This represents two pieces of bad news for you. First, you had better pick up the pace of your content. If you’re not, you’re falling further behind. Second, you had better work on making your content better and more relevant. The content noise is picking up, and just because you create content doesn’t mean you’re going to be successful. 6. 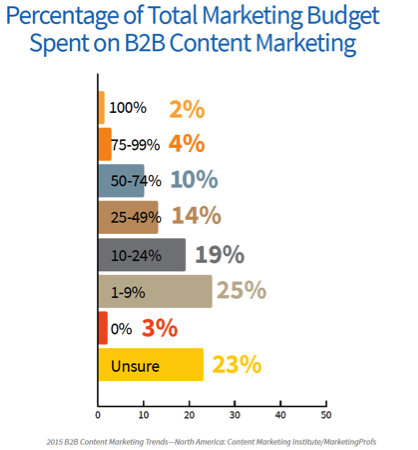 Companies today are spending on average 28% of the marketing budget (not including staff) on content marketing, and plan on increasing that in the future. This further supports my conclusion from #5. I started the post with this point, but let me make it again - content marketing no longer provides a competitive advantage. Instead the failure to excel at it creates an increasingly larger disadvantage. 7. 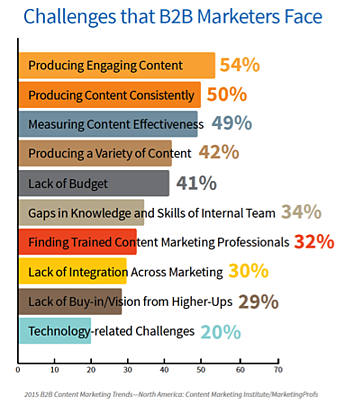 Producing engaging content is the biggest challenge today. I’ve been shouting for more than five years, “Someone has to write it!” Yes, it’s hard. It can even be annoying, and it’s almost always messy. But, it’s simply no longer optional – you must create content. 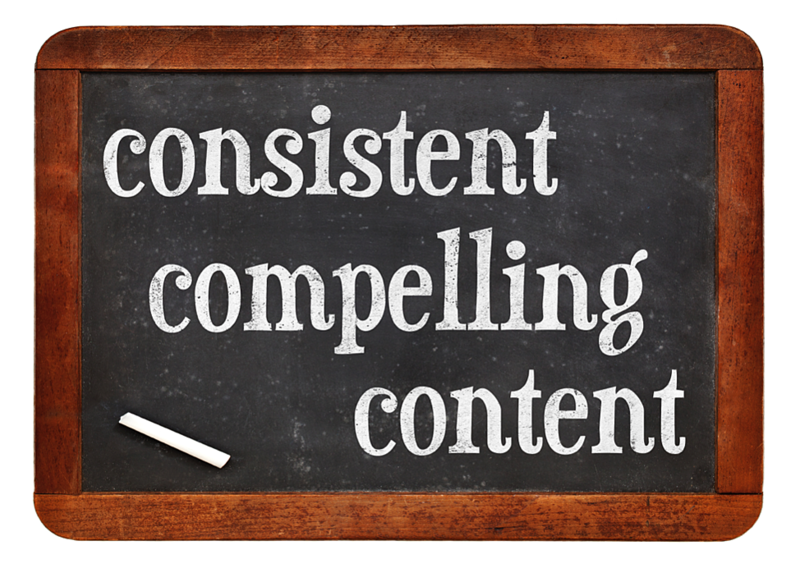 The upside is that while content is no longer a competitive advantage, creating consistent content that resonates still is. An interesting observation in the report is that larger companies are far more likely to outsource than smaller ones. The most effective practitioners are outsourcing at least a portion of their process. While I realize that I’m biased here, outsourcing provides several advantages for SMEs that are looking to scale growth. 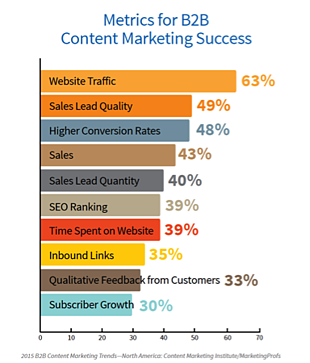 The bottom line is that content and inbound marketing are here to stay. Customers, by their very actions, demand it; and the companies that are adapting to this new world are excelling. I encourage you to download the report. While I’ve shared my main insights here, it is filled with far more valuable information, benchmarks and insights.